The team behind the Morrowind-based Skyrim mod Skywind has released an update video, to let everyone know they're "still alive and working just as hard". 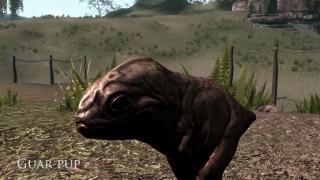 The video runs through a few of the locations and creatures that those who've played Morrowind will recognise, but updated for the Skyrim engine: places like West Gash and Bitter Coast, and creatures like the impressive Kwama Forager and the adorable Guar Pup. There's also mention of AI schedules and town clutter, which should serve to make this fan version of Morrowind feel a little more alive than the original. You can also see that intent in the trailer release back in March that shows the reimagined Seyda Neen, the starting town from the game. We don't yet know when Skywind will be ready and available, but when it does come out you'll need legitimate copies of both Morrowind and Skyrim to run it.